The intent of pressurized stairwells is to provide tenable conditions in stairwells for the evacuation or relocation of occupants during a fire. 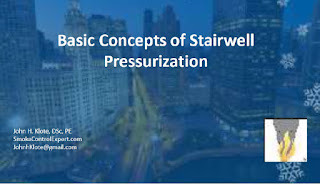 Pressurized stairwells are designed to operate between a minimum and maximum pressure difference. Stack effect and building complexity are major challenges to achieving acceptable pressurization.